[General description] This is a close up of the memorial which was erected in the grounds of the Methodist (now Uniting) Church at Aldinga. 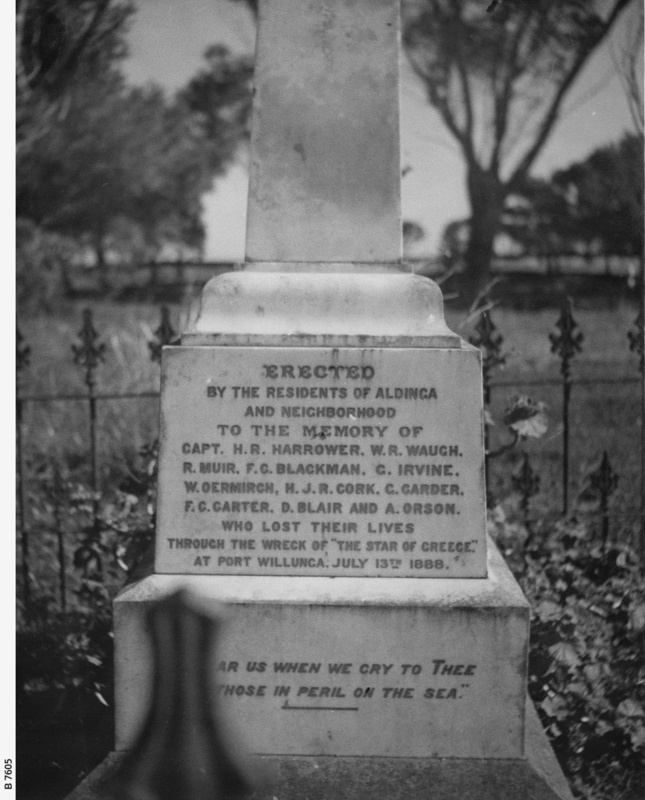 The text reads: 'Erected by the residents of Aldinga and neighbourhood / To the memory of: Capt. H.R.Harrower; W.R. Waugh; R. Muir; F.C. Blackman; C. Irvine; W. Oermirch; H.J.R. Cork; G. Carder; F.C. Carter; D. Blair and A. Orson who lost their lives through the wreck of the 'Star of Greece' at Port Willunga, July 13th, 1888' [On back of photograph] 'Star of Greece' / Memorial / Aldinga 1938'.